The use of cinnamon dates back thousands of years to ancient Egypt and biblical times, where it was once a gift for kings and gods. It was valued as a treatment for the common cold, for stomach ailments and to help in circulation. Read more on the history. Something that may be of interest is the research into cinnamon and weight loss! What could be better than a tasty way of losing weight! Read more about this research. New research done at the University of Texas also shows that it may even be beneficial in reducing the spread of cancer cells, especially in treatment of leukaemia and lymphoma. The chemical cinnameldehyde can increase the production of progesterone, which can help ease menstrual pain and can help regulate hormones. Its bacteria-fighting properties can also help fight yeast infections, and has even been shown to fight e-coli bacteria. That ability to stop bacterial growth is also a natural preservative quality that has been used for thousands of years to help keep food fresh. 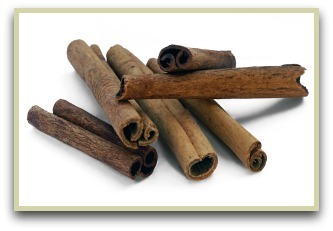 You don’t even have to ingest it to experience some of the health benefits of cinnamon. We all love the smell, and now a new study has shown that just a whiff of its sweet scent can help boost your memory and your cognitive function. Stirring a teaspoon of this delicious powder into your oatmeal or your savoury stew, or just sprinkling a little on your morning coffee, can help improve your health in so many ways. 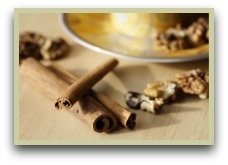 Another way of enjoying the cinnamon benefits is to make a tea from it. If this interests you, click here for my simple recipe.